Unlimited 1.5% cash back on every purchase with no cap on earnings and no rotating categories. Earn $100 after you spend $500 on purchases within the first 3 months. 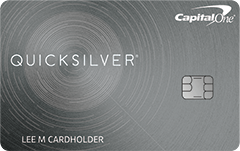 The Capital One® Quicksilver® Cash Rewards Credit Card offers unlimited 1.5% cash back on every purchase, every day, without any caps on what you can earn. There are no rotating categories, no points or miles with fluctuating value and no restrictions. Every time you swipe, you save. Beyond being extremely low maintenance, Capital One® Quicksilver® Cash Rewards Credit Card is also great for cardholders that are averse to fees. There is no annual fee and, like all Capital One credit cards, no foreign transaction fees on purchases made outside the U.S. The Capital One® Quicksilver® card also comes with an easily attainable signup bonus. If you spend $500 on purchases in the first 3 months, you can earn $100 bonus cash back. New cardholders also receive an introductory APR offer of 0% on purchases and balance transfers for the first 9 months, with a variable 13.74%-23.74% after. What’s even better, the rewards structure is extremely simple. Rewards are redeemable for check or statement credit in any amount, at any time. Your rewards never expire as long as your account is open. The extra benefits help make the Capital One® Quicksilver® Cash Rewards Credit Card card even better. Fraud coverage and personalized security alerts help you stay on top of your card’s use and 24/7 customer service representatives can help if anything goes wrong. In case your card is ever lost or stolen, you’re covered by $0 fraud liability. The Quicksilver® card also makes travel a breeze, with auto rental insurance, accident insurance, 24-hour travel assistance services, emergency card replacement and emergency cash advance. You also get access to dozens of perks like preferred seating at popular sports, music, film, and theater events, discounted travel packages and dining perks. Capital One wants to make sure their cardholders are practicing sound budgeting. Quicksilver® cardholders get an annual account summary with all their payments and transactions over the last year organized by category. All Capital One credit cards also come with a credit score tracker that helps you make credit-building decisions. These measures can go a long way in establishing and strengthening financial responsibility. So if you're looking for a simple cash-back credit card, the Capital One® Quicksilver® Cash Rewards Credit Card is a solid option. It’s especially great for someone with excellent credit that wants rewards for everyday spending without paying fees. Instant access to dozens of perks like preferred seating at popular sports, music, film, and theater events, travel packages and savings, and dining perks. Purchase Security and Extended Protection, Roadside Dispatch® Travel and Emergency Assistance Services, Auto Rental Collision Damage Waiver, Lost Luggage Reimbursement, and Travel Accident Insurance. 1-year warranty extension on eligible U.S. manufacturer’s warranties of 3 years of less up to $10,000 per claim and $50,000 per cardholder. Cash back can be redeemed as statement credit or check. You can also set up an automatic redemption preference at a set time each calendar year or when a specific monetary threshold has been reached. 0% Intro APR for the first 9 months after opening your account. 13.74%–23.74% APR after the first 9 months, based on your creditworthiness and other factors. Balance Transfer Fee: 3% of each transfer that posts to your account within the first 9 months. Cash Advance Fee: $10 or 3% of the advance amount, whichever is greater.